This was the last event of 2013 for us, and what a way to end the year, with this stunning wedding at Botleys Mansion. The theme was glamorous all white winter wonderland, with a dash of sparkle and crystals for a frosty festive wow factor. We have arranged several simply stunning weddings flowers at this beautiful venue but I have to admit this last wedding at Botleys Mansion will really take some effort to beat it. Technically this was a very very tricky style to arrange due to the sheer amount of flowers content going into each display, so the stress level was equally a tad high but the outcome was totally worth it! 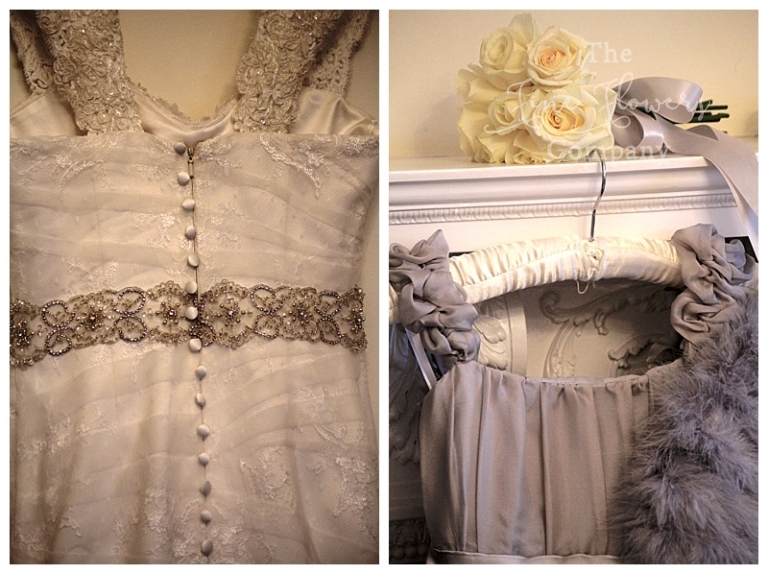 The glam bride for this end of year wedding at Botleys Mansion carried an equally glam bouquet of ivory roses and tulips studded with Swarovski crystals, and a silver & diamante cuff to echo the stunning silvery detailed vintage lace dress. The bridesmaids and the flower girls, wearing beautiful metalic silver gray dresses and feather shrugs, carried matching roses bouquets with silver ribbons. The venue flowers is really where the wow factor really kicked in for this amazing wedding at Botleys Mansion! We welcomed guests to the venue with a dramatic wintry Narnia display of white amaryllis, hydrangeas and roses, in a bold white vase, placed on the foyer’s central table. Carrying on the theme, the ceremony area was framed with two similarly grand focal displays, placed on opulent mirrored stands. We lined the aisle with storm vases and rose petal scatter and lined up frosty vase centrepieces and more candlelit storm vases along the mantlepiece in the ceremony room. For the ceremony table we used two of the guest table centrepieces – these were beautiful opulent domes of amaryllis, roses and hydrangeas atop crystal detailed glass vases. Lots of candlelight added a gorgeous soft light in the room. 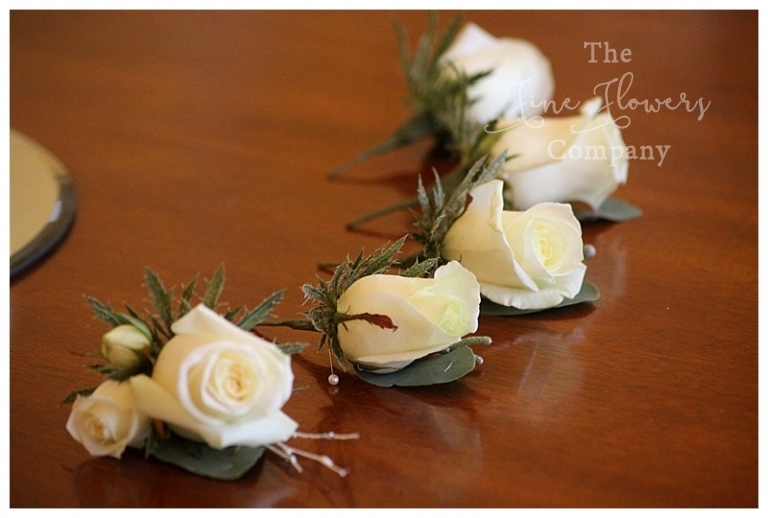 Following the ceremony, we guided the guests path down to the atrium, with a garland of sparkly white twigs accented with ivory rose clusters. For the guest tables, we used a mix of mainly tall centrepieces with a few low centrepieces here and there for a more interesting effect. The dramatic tall table centrepieces were super opulent floral spheres crammed with amaryllis, hydrangeas, roses and sparkly twigs, placed at the top of our amazing crystal draped cylinder vases. Smaller versions were created for the low cylinder vases on a few of the tables including the top table. And finally we lined up more pretty vases and votives along the windowsills. We have arranged flowers for many a wedding at Botleys Mansion so if you are planning a wedding at Botleys Mansion please take some inspiration from our Botleys mansion venue pages of featured weddings to see what works well with the scale of the venue. 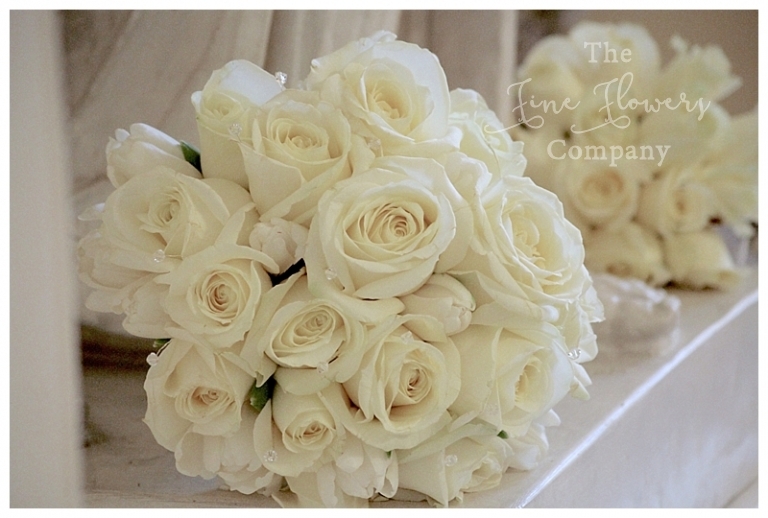 Happy New Year and thank you to Charlotte and all our 2013 brides who have entrusted us with their wedding flowers. We have thoroughly loved every minute of it! Posted in Botleys Mansion wedding, Surrey wedding flowersTags: Botleys Mansion wedding florist, Botleys Mansion wedding flowers, frosty white wedding flowers, new years eve wedding, white sparkly winter wedding, winter wedding flowers, winter wonderland wedding flowers, wintry centrepieces.